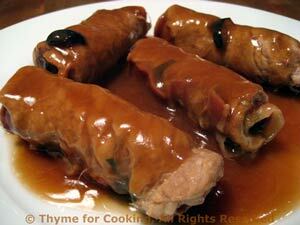 Thyme for Cooking Weekend Menu: Paupiettes, Provençal Veal Rolls, easy recipes. The Veal Rolls are an adaptation of a Provençal dish - I replaced the fresh parsley with spinach and used Greek olives rather than regular black. Schedule includes 25 minute break. 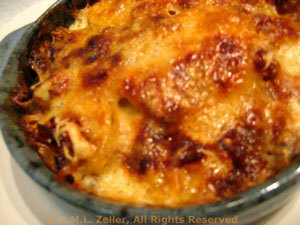 The sweet, caramelized shallots under the bubbling, golden cheese is wonderful. If you don't normally have milk on hand you can substitute chicken stock, or half cream (or crème fraiche) and half water. Heat butter in medium nonstick skillet over medium heat. Add shallots and sauté until they start to get transparent and tender, about 5 minutes. Let cook over medium low heat until very brown, about 15 minutes, stirring occasionally. In individual baking dishes (mine are 5" in diameter and 1" deep (10cm by 2.5cm) layer the potatoes neatly. Divide the milk and pour over the potatoes. Divide the shallots and spread on top. Divide the cheese and sprinkle evenly over both dishes. Cover with foil and bake at 400F (200C) for 35 minutes. Remove foil and continue baking another 15 minutes, until cheese starts to brown. Note: Put the dishes on a baking tray, for ease of handling and because they will probably cook over - saves oven clean-up. I use one large sheet of foil and loosely cover both of them with it. Note 2: You can bake this in one, larger baking dish. Try not to layer the potatoes deeper than 1" (2.5cm). Increase covered baking time by 10 minutes. 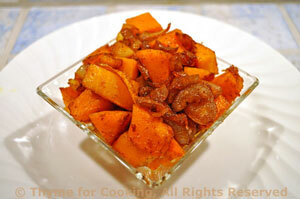 Butternut squash and shallots, simply fried until golden and tender. Clean and slice butternut squash, (.5", 1.25cm) then cut into bite-size cubes. Peel and vertically slice shallots into quarters. Heat oil in a large, nonstick skillet over medium heat. Add squash, shallots, paprika and sauté 15 - 20 minutes, until squash is nicely browned.